Hello! I made this card for Sweet Stamps' blog today. I stenciled the Roof Tiles pattern onto watercolor paper to give it some texture. I used three different colors and a blending tool to create the stenciled background. I used Sweet Stamps' Flutterby Sweet Cuts to die cut three butterflies and adhered it glued the cut out and solid image to each other I folded the wings up for some dimension. I then added the rhinestones to each of the butterfly's body. 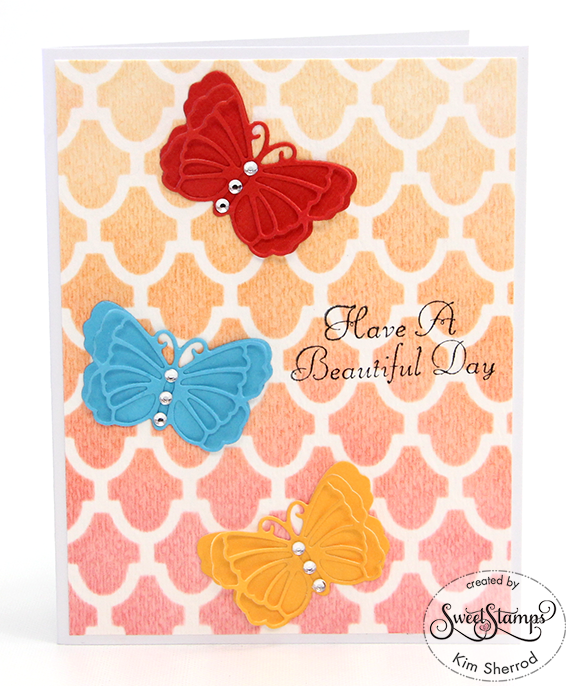 Next was to adhere the stencil cardstock onto the card front then placed the butterflies on top. I saved the sentiment for last so I know where to place it. Love the ink-blending! The colors are so gorgeous and shows such lovely gradient! Beautifully done with the butterflies, too! Thanks so much for playing Simon Says Stamp Wednesday “Anything Goes” Challenge!